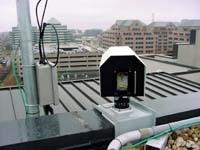 Free-Space Optics (FSO) is a line-of-sight technology that uses lasers to provide optical bandwidth connections. Currently, FSO is capable of up to 2.5 Gbps of data, voice and video communications through the air, allowing optical connectivity without requiring fiber-optic cable or securing spectrum licenses. FSO requires light, which can be focused by using either light emitting diodes (LEDs) or lasers (light amplification by stimulated emission of radiation). The use of lasers is a simple concept similar to optical transmissions using fiber-optic cables; the only difference is the medium. Light travels through air faster than it does through glass, so it is fair to classify FSO as optical communications at the speed of light. FSO technology is relatively simple. 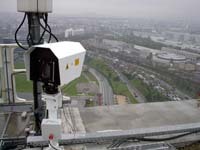 It's based on connectivity between FSO units, each consisting of an optical transceiver with a laser transmitter and a receiver to provide full duplex (bi-directional) capability. 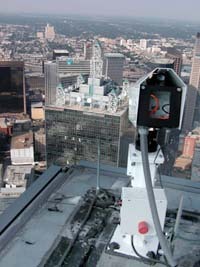 Each FSO unit uses a high-power optical source (i.e. laser), plus a lens that transmits light through the atmosphere to another lens receiving the information. The receiving lens connects to a high-sensitivity receiver via optical fiber. FSO technology requires no spectrum licensing. FSO is easily upgradeable, and its open interfaces support equipment from a variety of vendors, which helps service providers protect their investment in embedded telecommunications infrastructures. Originally used by the military and NASA, FSO has been used for more than 30 years to provide fast communication links in remote locations (view copy of original FSO white paper in German, "Information transmission by light beams through the atmosphere," published in Berlin, Germany, in the journal Nachrichtentechnik, vol. 6, p. 201-207, June 1968, by Dr. Erhard Kube). Recent advances in FSO technology have opened up mainstream communications uses, from short-term solutions for short distance network bridges to an attractive and viable alternative for service providers to deliver the promise of all-optical networks. As an optical technology, FSO is a natural extension of the metro optical network core, bringing cost-effective, reliable and fast optical capacity to the network's edge. While fiber-optic communication has gained acceptance in the telecommunications industry, FSO communication is still relatively new. FSO enables similar bandwidth transmission abilities as fiber optics, using similar optical transmitters and receivers and even enabling WDM-like technologies to operate through free space. FSO involves the optical transmission of voice, video, and data using air as the medium of transmission as opposed to fiber optic cable. Transmission using FSO technology is relatively simple. It involves two systems each consisting of an optical transceiver which consists of a laser transmitter and a receiver to provide full duplex (bi-directional) capability. Each FSO system uses a high-power optical source (e.g., laser ) plus a telescope that transmits light through the atmosphere to another telescope that receives the information. At that point, the receiving telescope connects to a high-sensitivity receiver through an optical fiber. Unlike radio frequencies, the technology requires no spectrum licenses. It is easily upgradeable, and its open interfaces support equipment from a variety of vendors, which helps carriers protect the investment in their embedded infrastructures. The increasing demand for high bandwidth in metro networks is relentless, and service providers' pursuit of a range of applications, including metro network extension, enterprise LAN-to-LAN connectivity, wireless backhaul and LMDS supplement has created an imbalance. This imbalance is often referred to as the "last mile bottleneck." Service providers are faced with the need to turn up services quickly and cost-effectively at a time when capital expenditures are constrained. But the last mile bottleneck is only part of a larger problem. Similar issues exist in other parts of the metro networks. "Connectivity bottleneck" better addresses the core dilemma. As any network planner will tell you, the connectivity bottleneck is everywhere in metro networks. From a technology standpoint, there are several options to address this "connectivity bottleneck," but most don't make economic sense. The first, most obvious choice, is fiber-optic cable. Without a doubt, fiber is the most reliable means of providing optical communications. But the digging, delays and associated costs to lay fiber often make it economically prohibitive. Moreover, once fiber is deployed, it becomes a "sunk" cost and cannot be re-deployed if a customer relocates or switches to a competing service provider, making it extremely difficult to recover the investment in a reasonable timeframe. Another option is radio frequency (RF) technology. RF is a mature technology that offers longer ranges distances than FSO, but RF-based networks require immense capital investments to acquire spectrum license. Yet, RF technologies cannot scale to optical capacities of 2.5 gigabits. The current RF bandwidth ceiling is 622 megabits. When compared to FSO, RF does not make economic sense for service providers looking to extend optical networks. The third alternative is wire- and copper-based technologies, (i.e. cable modem, T1s or DSL). Although copper infrastructure is available almost everywhere and the percentage of buildings connected to copper is much higher than fiber, it is still not a viable alternative for solving the connectivity bottleneck. The biggest hurdle is bandwidth scalability. Copper technologies may ease some short-term pain, but the bandwidth limitations of 2 megabits to 3 megabits makes them a marginal solution, even on a good day. The fourth-and often most viable-alternative is FSO. The technology is an optimal solution, given its optical base, bandwidth scalability, speed of deployment (hours versus weeks or months), re-deployment and portability, and cost-effectiveness (on average, one-fifth the cost of installing fiber-optic cable). Only 5 percent of the buildings in the United States are connected to fiber-optic infrastructure (backbone), yet 75 percent are within one mile of fiber. As bandwidth demands increase and businesses turn to high-speed LANs, it becomes more frustrating to be connected to the outside world through lower-speed connections such as DSL, cable modems or T1s. Most of the recent trenching to lay fiber has been to improve the metro core (backbone), while the metro access and edge have completely been ignored. Studies show that disconnects occur in the metro network core, primarily due to cost constraints and the deployment of such non-scalable, non-optical technologies such as LMDS. Metro optical networks have not yet delivered on their promise. High capacity at affordable prices still eludes the ultimate end-user. Enter FSO, which offers service providers a compelling alternative for optical connectivity and complement to fiber optics. Click here to view the FSO Shift Zone -- a timeline and market growth graphic showing FSO technology adoption. Fiber-optic cable and FSO share many similarities. However, there is a difference in how each technology transmits information. While fiber uses a relatively predictable medium that is subject to outside disturbances from wayward construction backhoes, gnawing rodents and even sharks when deployed under sea, FSO uses an open medium (the atmosphere) that is subject to its own potential outside disturbances. Networks with FSO must be designed to counter the atmosphere, which can affect an FSO system's capacity. FSO is also a line-of-sight technology and interconnecting points must be free from physical obstruction and able to "see" each other. All potential disturbances can be addressed through appropriate network design and planning. Fog: The major challenge to FSO communications is fog. Rain and snow have little effect on FSO, but fog is different. Fog is vapor composed of water droplets, which are only a few hundred microns in diameter but can modify light characteristics or completely hinder the passage of light through a combination of absorption, scattering and reflection. The primary way to counter fog when deploying FSO is through a network design that shortens FSO link distances and adds network redundancies. FSO installations in foggy cities such as San Francisco have successfully achieved carrier-class reliability. Absorption: Absorption occurs when suspended water molecules in the terrestrial atmosphere extinguish photons. This causes a decrease in the power density (attenuation) of the FSO beam and directly affects the availability of a system. Absorption occurs more readily at some wavelengths than others. However, the use of appropriate power, based on atmospheric conditions, and use of spatial diversity (multiple beams within an FSO unit) helps maintain the required level of network availability. Scattering: Scattering is caused when the wavelength collides with the scatterer. The physical size of the scatterer determines the type of scattering. When the scatterer is smaller than the wavelength, this is known as Rayleigh scattering. When the scatterer is of comparable size to the wavelength, this is known as Mie scattering. When the scatterer is much larger than the wavelength, this is known as non-selective scattering. In scattering-unlike absorption-there is no loss of energy, only a directional redistribution of energy that may have significant reduction in beam intensity for longer distances. Physical obstructions: Flying birds can temporarily block a single beam, but this tends to cause only short interruptions, and transmissions are easily and automatically resumed. 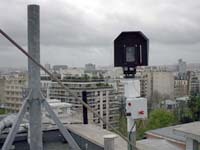 LightPointe uses multi-beam systems (spatial diversity) to address this issue, as well as other atmospheric conditions, to provide for greater availability. Building sway/seismic activity: The movement of buildings can upset receiver and transmitter alignment. LightPointe uses a divergent beam to maintain connectivity. LightPointe is developing a tracking device for use in ultra high-speed FSO systems mounted on freestanding towers. Scintillation: Heated air rising from the earth or man-made devices such as heating ducts creates temperature variations among different air pockets. This can cause fluctuations in signal amplitude which leads to "image dancing" at the FSO receiver end. LightPointe's unique multi-beam system is designed to address the effects of scintillation. Refractive turbulence: Refractive turbulence causes two primary effects on optical beams. Beam Wander: Beam wander is caused by turbulent eddies that are larger than the beam. Beam Spreading: Beam spreading-long-term and short-term-is the spread of an optical beam as it propagates through the atmosphere. Safety: To those unfamiliar with FSO, safety is often a concern because the technology uses lasers for transmission. This concern, however, is based on perception more than reality. The proper use and safety of lasers have been discussed since FSO devices first appeared in laboratories more than two decades ago. The two major concerns involve human exposure to laser beams (which present much more danger to the eyes than any other part of the human body) and high voltages within the laser systems and their power supplies. Standards have been set for laser safety and performance and our FSO systems comply with these standards.